The Frommers travel guide considers the Golden Gate Bridge "possibly the most beautiful, certainly the most photographed, bridge in the world". It opened in 1937 and was, until 1964, the longest suspension bridge main span in the world, at 4,200 feet (1,300 m). Before the bridge was built, the only practical short route between San Francisco and what is now Marin County was by boat across a section of San Francisco Bay. Ferry service began as early as 1820, with regularly scheduled service beginning in the 1840s for purposes of transporting water to San Francisco. 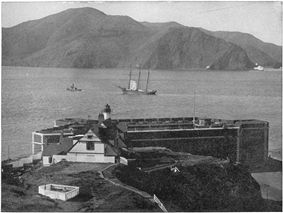 The Sausalito Land and Ferry Company service, launched in 1867, eventually became the Golden Gate Ferry Company, a Southern Pacific Railroad subsidiary, the largest ferry operation in the world by the late 1920s. Once for railroad passengers and customers only, Southern Pacific's automobile ferries became very profitable and important to the regional economy. The ferry crossing between the Hyde Street Pier in San Francisco and Sausalito in Marin County took approximately 20 minutes and cost US$1.00 per vehicle, a price later reduced to compete with the new bridge. The trip from the San Francisco Ferry Building took 27 minutes. Many wanted to build a bridge to connect San Francisco to Marin County. San Francisco was the largest American city still served primarily by ferry boats. Because it did not have a permanent link with communities around the bay, the city's growth rate was below the national average. Many experts said that a bridge couldn’t be built across the 6,700 ft (2,042 m) strait. It had strong, swirling tides and currents, with water 372 ft (113 m) deep at the center of the channel, and frequent strong winds. Experts said that ferocious winds and blinding fogs would prevent construction and operation. The bridge's name was first used when the project was initially discussed in 1917 by M.M. O'Shaughnessy, city engineer of San Francisco, and Strauss. The name became official with the passage of the Golden Gate Bridge and Highway District Act by the state legislature in 1923. Preliminary discussions leading to the eventual building of the Golden Gate Bridge were held on January 13, 1923, at a special convention in Santa Rosa, CA. The Santa Rosa Chamber was charged with considering the necessary steps required to foster the construction of a bridge across the Golden Gate by then Santa Rosa Chamber President Frank Doyle (the street Doyle Drive leading up to the bridge is named after him). On June 12, the Santa Rosa Chamber voted to endorse the actions of the "Bridging the Golden Gate Association" by attending the meeting of the Boards of Supervisors in San Francisco on June 23 and by requesting that the Board of Supervisors of Sonoma County also attend. By 1925, the Santa Rosa Chamber had assumed responsibility for circulating bridge petitions as the next step for the formation of the Golden Gate Bridge. Strauss was chief engineer in charge of overall design and construction of the bridge project. However, because he had little understanding or experience with cable-suspension designs, responsibility for much of the engineering and architecture fell on other experts. Strauss' initial design proposal (two double cantilever spans linked by a central suspension segment) was unacceptable from a visual standpoint. The final graceful suspension design was conceived and championed by New York’s Manhattan Bridge designer Leon Moisseiff. The Golden Gate Bridge and Highway District, authorized by an act of the California Legislature, was incorporated in 1928 as the official entity to design, construct, and finance the Golden Gate Bridge. However, after the Wall Street Crash of 1929, the District was unable to raise the construction funds, so it lobbied for a $30 million bond measure. The bonds were approved in November 1930, by votes in the counties affected by the bridge. The construction budget at the time of approval was $27 million. However, the District was unable to sell the bonds until 1932, when Amadeo Giannini, the founder of San Francisco–based Bank of America, agreed on behalf of his bank to buy the entire issue in order to help the local economy. Construction began on January 5, 1933. The project cost more than $35 million, completing ahead of schedule and under budget. The Golden Gate Bridge construction project was carried out by the McClintic-Marshall Construction Co., a subsidiary of Bethlehem Steel Corporation founded by Howard H. McClintic and Charles D. Marshall, both of Lehigh University. Some 1.2 million steel rivets hold the bridge together. This is one of those replaced during the seismic retrofit of the bridge after the 1989 Loma Prieta earthquake. Strauss remained head of the project, overseeing day-to-day construction and making some groundbreaking contributions. A graduate of the University of Cincinnati, he placed a brick from his alma mater's demolished McMicken Hall in the south anchorage before the concrete was poured. He innovated the use of movable safety netting beneath the construction site, which saved the lives of many otherwise-unprotected steelworkers. Of eleven men killed from falls during construction, ten were killed (when the bridge was near completion on May 27, 1937) when the net failed under the stress of a scaffold that had fallen. According to Travel Channel's Monumental Mysteries, the workers platform that was attached to a rolling hanger on a track collapsed when the bolts that were connected to the track were too small and the amount of weight was too great to bear. The platform fell into the safety net, but was too heavy and the net gave way. Two out of the twelve workers survived the 200-foot fall into the icy waters, including the 37-year-old foreman, Slim Lambert. Nineteen others who were saved by the net over the course of construction became proud members of their Half Way to Hell Club. The project was finished and opened May 27, 1937. It was completed $1.3 million under budget. The Bridge Round House diner was then included in the southeastern end of the Golden Gate Bridge, adjacent to the tourist plaza which was renovated in 2012. The Bridge Round House, an Art Deco design by Alfred Finnila completed in 1938, has been popular throughout the years as a starting point for various commercial tours of the bridge and an unofficial gift shop. The diner was renovated in 2012 and the gift shop was then removed as a new, official gift shop has been included in the adjacent plaza. During the bridge work, the Assistant Civil Engineer of California Alfred Finnila had overseen the entire iron work of the bridge as well as half of the bridge's road work. With the death of Jack Balestreri in April 2012, all workers involved in the original construction are now deceased. A pedestrian poses at the old railing on opening day, 1937. Official invitation to the opening of the bridge. This copy was sent to the City of Seattle. The bridge-opening celebration began on May 27, 1937 and lasted for one week. The day before vehicle traffic was allowed, 200,000 people crossed by foot and roller skates. On opening day, Mayor Angelo Rossi and other officials rode the ferry to Marin, then crossed the bridge in a motorcade past three ceremonial "barriers", the last a blockade of beauty queens who required Joseph Strauss to present the bridge to the Highway District before allowing him to pass. An official song, "There's a Silver Moon on the Golden Gate", was chosen to commemorate the event. 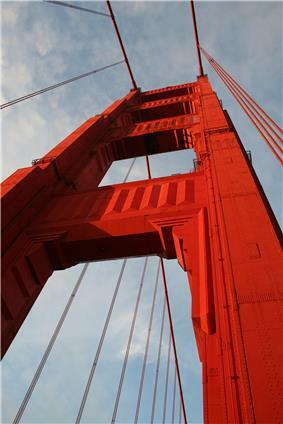 Strauss wrote a poem that is now on the Golden Gate Bridge entitled "The Mighty Task is Done." The next day, President Roosevelt pushed a button in Washington, D.C. signaling the official start of vehicle traffic over the Bridge at noon. When the celebration got out of hand, the SFPD had a small riot in the uptown Polk Gulch area. Weeks of civil and cultural activities called "the Fiesta" followed. A statue of Strauss was moved in 1955 to a site near the bridge. In May 1987, as part of the 50th anniversary celebration, the Golden Gate Bridge district again closed the bridge to automobile traffic and allowed pedestrians to cross the bridge. However, this celebration attracted 750,000 to 1,000,000 people, and ineffective crowd control meant the bridge became congested with roughly 300,000 people, causing the center span of the bridge to flatten out under the weight. Although the bridge is designed to flex in that way under heavy loads, and was estimated not to have exceeded 40% of the yielding stress of the suspension cables, bridge officials stated that uncontrolled pedestrian access was not being considered as part of the 75th anniversary on Sunday, May 27, 2012, because of the additional law enforcement costs required "since 9/11". On the south side of the bridge a 36.5-inch-wide (93 cm) cross-section of the cable, containing 27,572 wires, is on display. Until 1964, the Golden Gate Bridge had the longest suspension bridge main span in the world, at 4,200 feet (1,300 m). Since 1964 its main span length has been surpassed by ten bridges; it now has the second-longest main span in the United States, after the Verrazano-Narrows Bridge in New York City. Total length of the Golden Gate Bridge from abutment to abutment is 8,981 feet (2,737 m). The Golden Gate Bridge's clearance above high water averages 220 feet (67 m) while its towers, at 746 feet (227 m) above the water, were the world's tallest on a suspension bridge until 1998 when bridges in Denmark and Japan were completed. The weight of the roadway is hung from two cables that pass through the two main towers and are fixed in concrete at each end. Each cable is made of 27,572 strands of wire. There are 80,000 miles (130,000 km) of wire in the main cables. The bridge has approximately 1,200,000 total rivets. Most maps and signage mark the bridge as part of the concurrency between U.S. Route 101 and California State Route 1. Although part of the National Highway System, the bridge is not officially part of California's Highway System. For example, under the California Streets and Highways Code § 401, Route 101 ends at "the approach to the Golden Gate Bridge" and then resumes at "a point in Marin County opposite San Francisco". The Golden Gate Bridge, Highway and Transportation District has jurisdiction over the segment of highway that crosses the bridge instead of the California Department of Transportation (Caltrans). The median markers between the lanes are moved to conform to traffic patterns. On weekday mornings, traffic flows mostly southbound into the city, so four of the six lanes run southbound. Conversely, on weekday afternoons, four lanes run northbound. During off-peak periods and weekends, traffic is split with three lanes in each direction, or three and two lanes with one buffer lane. Traffic is separated by small, plastic pylons, and from 1971 through 2007, there were 16 fatalities from head-on collisions. To improve safety, the speed limit on the Golden Gate Bridge was reduced from 55 to 45 mph (89 to 72 km/h) on October 1, 1983. Although there has been discussion concerning the installation of a movable barrier since the 1980s, only in March 2005 did the Bridge Board of Directors commit to finding funding to complete the $2 million study required prior to the installation of a movable median barrier. The movable barrier is set to be installed on January 2015, during which the bridge will be closed completely for 52 hours, starting on a Friday night. This is the longest closure in the history of the bridge. Bus service across the bridge is provided by two public transportation agencies: San Francisco Muni and Golden Gate Transit. Muni offers Saturday and Sunday service on the 76X Marin Headlands Express bus line, and Golden Gate Transit runs numerous bus lines throughout the week. The southern end of the bridge, near the toll plaza and parking lot, is also accessible daily from 5:30 a.m. to midnight by Muni line 28. The color of the bridge is officially an orange vermillion called international orange. The color was selected by consulting architect Irving Morrow because it complements the natural surroundings and enhances the bridge's visibility in fog. Aesthetics was the foremost reason why the first design of Joseph Strauss was rejected. Upon re-submission of his bridge construction plan, he added details, such as lighting, to outline the bridge's cables and towers. In 1999, it was ranked fifth on the List of America's Favorite Architecture by the American Institute of Architects. The bridge was originally painted with red lead primer and a lead-based topcoat, which was touched up as required. In the mid-1960s, a program was started to improve corrosion protection by stripping the original paint and repainting the bridge with zinc silicate primer and vinyl topcoats. Since 1990 acrylic topcoats have been used instead for air-quality reasons. The program was completed in 1995 and it is now maintained by 38 painters who touch up the paintwork where it becomes seriously corroded. The last of the construction bonds were retired in 1971, with $35 million in principal and nearly $39 million in interest raised entirely from bridge tolls. In November 2006, the Golden Gate Bridge, Highway and Transportation District recommended a corporate sponsorship program for the bridge to address its operating deficit, projected at $80 million over five years. The District promised that the proposal, which it called a "partnership program," would not include changing the name of the bridge or placing advertising on the bridge itself. In October 2007, the Board unanimously voted to discontinue the proposal and seek additional revenue through other means, most likely a toll increase. In an effort to save $19.2 million over the following 10 years, the Golden Gate District voted in January 2011 to eliminate all toll takers by 2012 and use only open road tolling. Subsequently, this was delayed and toll taker elimination occurred in March 2013. The cost savings have been revised to $19 million over an eight-year period. In addition to FasTrak, the Golden Gate District implemented the use of license plate tolling (branded as "Pay-by-Plate"), and also a one time payment system for drivers to pay before or after their trip on the bridge. Twenty-eight positions were eliminated as part of this plan. On April 7, 2014, the toll for users of the FasTrak electronic toll collection system was increased from $5 to $6, while the toll for drivers using either the license plate tolling or the one time payment system was raised from $6 to $7. Bicycle, pedestrian, and northbound motor vehicle traffic remain toll free. For vehicles with more than two axles, the toll rate is $7 per axle for those using license plate tolling or the one time payment system, and $6 per axle for FasTrak users. During peak traffic hours, carpool vehicles carrying two or more people and motorcycles pay a discounted toll of $4; drivers must have Fastrak to take advantage of this carpool rate. The Golden Gate Transportation District then plans to increase the tolls by 25 cents in July 2015, and then by another 25 cents each of the next three years. In March 2008 the Golden Gate Bridge District board approved a resolution to start congestion pricing at the Golden Gate Bridge, charging higher tolls during peak hours, but rising and falling depending on traffic levels. This decision allowed the Bay Area to meet the federal requirement to receive $158 million in federal transportation funds from USDOT Urban Partnership grant. As a condition of the grant, the congestion toll was to be in place by September 2009. The first results of the study, called the Mobility, Access and Pricing Study (MAPS), showed that a congestion pricing program is feasible. The different pricing scenarios considered were presented in public meetings in December 2008. In August 2008 transportation officials ended the congestion pricing program in favor of varying rates for metered parking along the route to the bridge including on Lombard Street and Van Ness Avenue. Official count of the jumpers ended 1995 on 997. The Golden Gate Bridge is the second-most used suicide site/suicide bridge in the world, after the Nanjing Yangtze River Bridge (see List of suicide sites). The deck is about 245 feet (75 m) above the water. After a fall of four seconds, jumpers hit the water at around 75 mph or about 120 km/h. Most of the jumpers die from impact trauma. About 5% of the jumpers survive the initial impact but generally drown or die of hypothermia in the cold water. Most suicidal jumps occur on the side facing the bay. The side facing the Pacific is closed to pedestrians. An official suicide count was kept until the year 1995, sorted according to which of the bridge's 128 lamp posts the jumper was nearest when he or she jumped. The official count ended on June 5, 1995 on the 997th jump; jumper No. 1000, Eric Atkinson (25), jumped on July 3, 1995. Earlier in 1995, a local shock jock had offered a case of Snapple to the family of the 1000th suicide victim. Consequently, Marin County coroner Ken Holmes asked local media to stop reporting the total number of jumpers. By 2012 the unofficial count exceeded 1,600 (in which the body was recovered or someone saw the jump) and new suicides were occurring about once every two weeks, according to a San Francisco Chronicle analysis. The most suicides in one month were in August 2013, when 10 jumped, one every three days. The total count for the year 2013 was 46, with an additional 118 attempts prevented, making it the year with the highest tally so far. The rate of incidence has risen to nearly one every other day. The youngest jumper has been 5 year old Marilyn DeMont, who was told to jump and was followed by her father in June 1945. For comparison, the reported third-most popular place to commit suicide in the world, Aokigahara Forest in Japan, has a record of 108 bodies, found within the forest in 2004, with an average of 30 a year. There were 34 bridge-jump suicides in 2006 whose bodies were recovered, in addition to four jumps that were witnessed but whose bodies were never recovered, and several bodies recovered suspected to be from bridge jumps. The California Highway Patrol removed 70 apparently suicidal people from the bridge that year. There is no accurate figure on the number of suicides or completed jumps since 1937, because many were not witnessed. People have been known to travel to San Francisco specifically to jump off the bridge, and may take a bus or cab to the site; police sometimes find abandoned rental cars in the parking lot. Currents beneath the bridge are strong and some jumpers have undoubtedly been washed out to sea without being seen. The fatality rate of jumping is roughly 98%. As of July 2013, only 34 people are known to have survived the jump. Those who do survive strike the water feet-first and at a slight angle, although individuals may still sustain broken bones or internal injuries. One young woman, Sarah Rutledge Birnbaum, survived, but returned to jump again and died the second time. One young man survived a jump in 1979, swam to shore, and drove himself to a hospital. The impact cracked several of his vertebrae. On March 10, 2011, 17-year-old Luhe "Otter" Vilagomez from Windsor High School in Windsor, California, survived a jump from the bridge, breaking his coccyx and puncturing one lung, though he said his attempt was for "fun" and not suicide. The teen was helped to shore by Frederic Lecouturier, 55, who was surfing under the bridge when he saw Vilagomez jump. The California Highway Patrol ("CHP") recommended that the San Francisco District Attorney's Office charge the student with misdemeanor trespassing (a charge that entails climbing any rail, cable, suspender rope, tower or superstructure not intended for public use), punishable by up to a year in the county jail and/or a fine up to $10,000. Additionally, the CHP Marin Area recommended the teen undergo a medical/psychiatric evaluation by medical professionals. Engineering professor Natalie Jeremijenko, as part of her "Bureau of Inverse Technology" art collective, created a "Despondency Index" by correlating the Dow Jones Industrial Average with the number of jumpers detected by "Suicide Boxes" containing motion-detecting cameras, which she claimed to have set up under the bridge. The boxes purportedly recorded 17 jumps in three months, far greater than the official count. The Whitney Museum, although questioning whether Jeremijenko's suicide-detection technology actually existed, nevertheless included her project in its prestigious Whitney Biennial. Various methods have been tried to reduce the number of suicides. The bridge is fitted with suicide-hotline telephones and staff patrol the bridge in carts, looking for people who appear to be planning to jump. Ironworkers on the bridge also volunteer their time to prevent suicides by talking to or wrestling down suicidal people. The bridge is now closed to pedestrians at night. Cyclists are still permitted across at night, but can buzz themselves in and out through the remotely controlled security gates. Attempts to introduce a suicide barrier have been thwarted by engineering difficulties, high costs, and public opposition. One recurring proposal had been to build a barrier to replace or augment the low railing, a component of the bridge's original architectural design, as amended by the second designer in the final blueprint. [upper-alpha 1] New barriers have eliminated suicides at other landmarks around the world, but were opposed for the Golden Gate Bridge for reasons of cost, aesthetics, and safety, as the load from a poorly designed barrier could significantly affect the bridge's structural integrity during a strong windstorm. On June 27, 2014 California approved a funding plan to install a suicide barrier beneath the bridge to catch suicide jumpers. Strong appeals for a suicide barrier, fence, or other preventive measures were raised again by a well-organized vocal minority of psychiatry professionals, suicide barrier consultants, and families of jumpers beginning in January 2005. These efforts were given momentum by two films dealing with the topic of suicide and the Golden Gate Bridge. On January 14, 2005 the San Francisco Chronicle published an open letter by writer-director Jenni Olson calling for a suicide barrier on the Golden Gate Bridge. The letter was, in part, an excerpt from the script of her film The Joy of Life, which world-premiered the following week, on January 20, 2005, at the Sundance Film Festival. The day before, on January 19, 2005, the Chronicle broke the news that filmmaker Eric Steel had been shooting suicide leaps from the bridge during 2004 for his film The Bridge, which would be released in 2006. A week later, The Joy of Life world-premiered at the Sundance Film Festival and video copies of the film were circulated to members of the Bridge District board of directors with the help of the Psychiatric Foundation of Northern California. In the fall of 2005 the San Francisco Chronicle published a seven-part series of articles, titled "Lethal Beauty", focusing on the problem of suicide and the Golden Gate Bridge and emphasizing that a solution was possible but even desirable. The 2006 release of The Bridge exerted additional pressure on the Bridge District and created continued public awareness. Filmmaker Eric Steel and his production crew spent 2004 filming the bridge from several vantage points, in order to film actual suicide jumps. The film chronicled 23 jumps, most notably that of Gene Sprague, as well as a handful of thwarted attempts. The film also contained interviews with surviving family members of those who jumped; interviews with witnesses; and, in one segment, an interview with Kevin Hines who, as a 19-year-old in 2000, survived a suicide plunge from the span and is now a vocal advocate for some type of bridge barrier or net to prevent such incidents. Kevin Briggs, a highway patrolman on the bridge, is credited with saving hundreds of lives of would-be jumpers by talking to them before they can take the plunge. Despite past suicides, Briggs and others in his department estimate that they save at least 80–90% of people bent on jumping thanks to cameras and their own dialogue. On October 10, 2008 the Golden Gate Bridge Board of Directors voted 14 to 1 to install a plastic-covered stainless-steel net below the bridge as a suicide deterrent. The netting barrier will extend 20 feet (6 m) on either side of the bridge and is expected to cost $40–50 million to complete. However, there was concern that lack of funding could delay the net's deployment. In March 2014, The New York Times reported that it is expected that the directors of the Bridge District will vote to change its policy and allow the use of toll money to supplement governmental funds for a suicide barrier. Funding for building a suicide barrier consisting Stainless Steel netting 20 ft wide and 20 feet below the bridge was unanimously approved by the Golden Gate Bridge Board of Directors on June 27, 2014. The Metropolitan Transportation Commission approved to contribute 27M of the 76M overall cost for the project, federal, state, and local authorities will likewise contribute to the project. Funding was a major obstacle for approval of the suicide barrier which was approved by the Golden Gate Bride and Transportation District board in 2010 after conducting a design study costing 5M. However, resources such as funding weren't available and the project was delayed as there was schedule of completion. In 2012, President Obama enacted the Transportation Re-authorization Bill permitting federal funding towards transportation infrastructure projects. Initially the bill didn't divert funding automatically as advocates of the barrier, such as 'Bridge Rail Foundation', were eventually successful in securing support for the project in 2014. The completion of the project is estimated to be completed in 2018. Since its completion, the Golden Gate Bridge has been closed because of weather conditions only three times: on December 1, 1951, because of gusts of 69 mph (111 km/h); on December 23, 1982, because of winds of 70 mph (113 km/h); and on December 3, 1983, because of wind gusts of 75 mph (121 km/h). An anemometer, placed midway between the two towers on the west side of the bridge, has been used to measure wind speeds. Another anemometer was placed on one of the towers. Modern knowledge of the effect of earthquakes on structures led to a program to retrofit the Golden Gate to better resist seismic events. The proximity of the bridge to the San Andreas Fault places it at risk for a significant earthquake. Once thought to have been able to withstand any magnitude of foreseeable earthquake, the bridge was actually vulnerable to complete structural failure (i.e., collapse) triggered by the failure of supports on the 320-foot (98 m) arch over Fort Point. A $392 million program was initiated to improve the structure's ability to withstand such an event with only minimal (repairable) damage. One challenging undertaking is completing this program without disrupting traffic. A complex electro-hydraulic synchronous lift system was custom built for construction of temporary support towers and a series of intricate lifts, transferring the loads from the existing bridge onto the temporary supports. This was completed with engineers from Balfour Beatty and Enerpac, accomplishing this task without disrupting day-to-day San Francisco commuter traffic. The retrofit was planned to be completed in 2012. The former elevated approach to the Golden Gate Bridge through the San Francisco Presidio, known as Doyle Drive, dated to 1933 and was named after Frank P. Doyle, President and son of the founder of the Exchange Bank in Santa Rosa, and the man, who more than any other person, made it possible to build the Golden Gate Bridge. The highway carried about 91,000 vehicles each weekday between downtown San Francisco and the North Bay and points north. The road was deemed "vulnerable to earthquake damage", has a problematic 4-lane design, and lacks shoulders, and a San Francisco County Transportation Authority study recommended that the current structure be replaced. 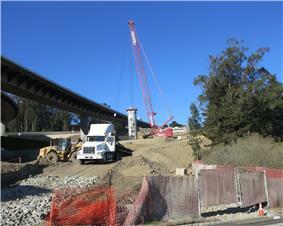 Construction on the $1 billion replacement, temporarily known as the Presidio Parkway, began in December 2009. The elevated Doyle Drive was demolished on the weekend of April 27–30, 2012. Traffic now uses a part of the partially completed Presidio Parkway, which is expected to be completed in 2016. As of May 2012, an official at Caltrans said there is no plan to permanently rename the portion known as Doyle Drive. As a prominent American landmark, the Golden Gate Bridge has been used in numerous media, including books, films and video games. ^ "Golden Gate Transportation District". Goldengate.org. Retrieved June 20, 2010. ^ "Annual Vehicle Crossings and Toll Revenues, FY 1938 to FY 2011". Golden Gate Bridge, Highway and Transportation District. Retrieved December 23, 2012. ^ "Golden Gate Bridge". Office of Historic Preservation, California State Parks. Retrieved 2012-10-08. ^ "City of San Francisco Designated Landmarks". City of San Francisco. Retrieved October 21, 2012. ^ "American Society of Civil Engineers Seven Wonders". Asce.org. July 19, 2010. Retrieved August 30, 2010. ^ "Golden Gate Bridge – Museum/Attraction View". Frommers. 2006. Retrieved April 13, 2006. ^ a b c d e f g h i j "Two Bay Area Bridges". US Department of Transportation, Federal Highway Administration. Retrieved March 9, 2009. ^ Fimrite, Peter (April 28, 2005). "Ferry tale – the dream dies hard: 2 historic boats that plied the bay seek buyer – anybody". San Francisco Chronicle. Retrieved October 31, 2007. ^ Harlan, George H. (1967). San Francisco Bay Ferryboats. Howell-North Books. ^ a b Span, Guy (May 4, 2002). "So Where Are They Now? The Story of San Francisco's Steel Electric Empire". Bay Crossings. ^ a b c d e Sigmund, Pete (2006). "The Golden Gate: 'The Bridge That Couldn't Be Built',". Construction Equipment Guide. Retrieved May 31, 2007. ^ Barnard, Patrick; Hanes, Rubin, Kvitek (July 18, 2006). "Giant Sand Waves at the Mouth of San Francisco Bay". Eos 87 (29). ^ a b c Owens, T.O. (2001). The Golden Gate Bridge. The Rosen Publishing Group. ^ a b "The American Experience:People & Events: Joseph Strauss (1870–1938)". Public Broadcasting Service. Retrieved November 7, 2007. ^ "Bridging the Bay: Bridges That Never Were". UC Berkeley Library. 1999. Retrieved April 13, 2006. ^ Miller, John B. (2002) "Case Studies in Infrastructure Delivery" Springer, ISBN 0-7923-7652-8. ^ a b "People and Events: Joseph Strauss (1870–1938)". Public Broadcasting Service. Retrieved December 12, 2007. ^ "The American Experience:People & Events: Irving Morrow (1884–1952)". Public Broadcasting Service. Retrieved November 7, 2007. ^ a b "American Experience:Leon Moisseiff (1872–1943)". Public Broadcasting Service. Retrieved November 7, 2007. ^ Fort Point, Golden Gate Bridge, Highway and Transportation District. ^ a b c d e "The American Experience:Charles Alton Ellis (1876–1949)". Public Broadcasting Service. Retrieved November 7, 2007. ^ "Bridging the Bay: Bridges That Never Were". UC Berkeley Library. Retrieved February 19, 2007. ^ "72 years ago today, iconic Golden Gate Bridge finished construction ahead of schedule & $1.3 million under budget". May 27, 2009. Retrieved April 10, 2013. ^ Inc, Time (March 1, 1937). "Life On The American Newsfront: Ten Men Fall To Death From Golden Gate Bridge". Life Magazine: 20–21. ^ "Frequently Asked Questions about the Golden Gate Bridge". Golden Gate Bridge, Highway and Transportation District. Retrieved November 7, 2007. ^ a b King, John (May 25, 2012). "Golden Gate Bridge's Plaza Flawed but Workable". ^ a b Kligman, David (May 25, 2012). "From Sea to Shining Sea: PG&E’s Earley Joins Tribute to Golden Gate Bridge". Currents. ^ San Francisco Examiner. May 27, 1982. No. 147, p. 2. Golden Gate Bridge – 45th anniversary of completion. ^ Pollalis, Spiro N. and Otto, Caroline (1990). "THE GOLDEN GATE BRIDGE". Harvard Design School. Retrieved April 3, 2011. ^ Terrence McCarthy (May 26, 1987). "Golden Gate Crowd Made Bridge Bend". New York Times. Retrieved April 3, 2011. ^ Mark Prado (July 23, 2010). "Golden Gate Bridge officials nix walk for 75th anniversary". Marin Independent Journal. Retrieved April 3, 2011. ^ "Golden Gate Festival :: Golden Gate Bridge 75th Anniversary". Golden Gate National Parks Conservancy. Retrieved March 21, 2012. ^ Fowler, Geoffrey A. (May 24, 2012). "A Historian's Long View of Golden Gate Bridge". Wall Street Journal. pp. A13C. Retrieved August 31, 2013. ^ "Golden Gate Bridge Facts". Gocalifornia.about.com. Retrieved June 20, 2010. ^ "Toll Rates & Traffic Operations". Golden Gate Bridge, Highway and Transportation District. Retrieved December 3, 2013. ^ "Roadway Configuration / Reversible Lanes". Golden Gate Bridge, Highway and Transportation District. Retrieved December 23, 2012. ^ a b c "Additional Information – Moveable Median Barrier Project". Golden Gate Bridge, Highway and Transportation District. Retrieved September 29, 2014. ^ "Key Dates". Golden Gate Bridge, Highway and Transportation District. Retrieved December 23, 2012. ^ a b Lucas, Scott (July 18, 2013). "Kevin Hines Is Still Alive". Modern Luxury. Retrieved July 18, 2013. ^ The Golden Gate Bridge, Sidewalk Access for Pedestrians and Bicyclists. Goldengatebridge.org. Retrieved on June 14, 2013. ^ "Muni Route 76X Marin Headlands". San Francisco Municipal Transportation Agency. Retrieved July 2, 2014. ^ "Golden Gate Transit bus service". Golden Gate Transit. Retrieved August 19, 2012. ^ "Muni Route 28 19th Avenue". San Francisco Municipal Transportation Agency. Retrieved August 19, 2012. ^ "Golden Gate Bridge: Construction Data". Golden Gate Bridge, Highway and Transportation District. Retrieved August 20, 2007. ^ Stamberg, Susan. "The Golden Gate Bridge's Accidental Color". npr.org. npr.org. Retrieved April 27, 2011. ^ Rodriguez, Joseph A. (2000). 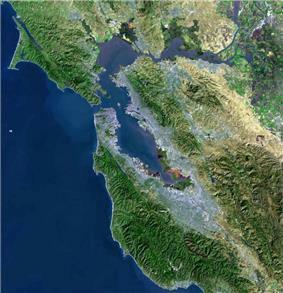 "Planning and Urban Rivalry in the San Francisco Bay Area in the 1930s". Journal of Planning Education and Research 20: 66–76. ^ "Golden Gate Bridge: Research Library: How Often is the Golden Gate Bridge Repainted?". Golden Gate Bridge, Highway and Transportation District. 2006. Retrieved April 13, 2006. ^ "Golden Gate Bridge: Construction Data: Painting The Golden Gate Bridge". Golden Gate Bridge, Highway and Transportation District. 2006. Retrieved April 13, 2006. ^ "Golden Gate Bridge: Construction Data: How Many Ironworkers and Painters Maintain the Golden Gate Bridge?". Golden Gate Bridge, Highway and Transportation District. 2006. Retrieved April 13, 2006. ^ "Key Dates". Research Library. Retrieved December 11, 2007. ^ Jonathan Curiel, Chronicle Staff Writer (October 27, 2007). "Golden Gate Bridge directors reject sponsorship proposals". San Francisco Chronicle. Retrieved October 27, 2007. ^ "Partnership Program Status". Golden Gate Bridge, Highway and Transportation District. Retrieved October 27, 2007. ^ Cabanatuan, Michael (January 29, 2011). "Golden Gate Bridge to eliminate toll takers". San Francisco Chronicle. Retrieved January 30, 2011. ^ "All Electronic Tolling on the Golden Gate Bridge". Goldengate.org. Retrieved March 26, 2013. ^ "Toll 2014". Goldengate.org. April 7, 2014. Retrieved April 26, 2014. ^ Cabanatuan, Michael (April 7, 2014). "Tolls for crossing Golden Gate Bridge rise $1". SFGate.com. Retrieved April 26, 2014. ^ Bolling, David (May 29, 2008). "GG Bridge tolls could top $7, June 11 meeting will set new rates". Sonoma Index-Tribune. ^ The San Francisco Chronicle (March 19, 2008). "Congestion Pricing Approved for Golden Gate Bridge". planetizen.com. Retrieved April 3, 2008. ^ Michael Cabanatuan (March 15, 2008). "Bridge raises tolls, denies Doyle Dr. funds". The San Francisco Chronicle. Retrieved April 3, 2008. ^ "Mobility, Access and Pricing Study". ^ Malia Wollan (January 4, 2009). "San Francisco Studies Fees to Ease Traffic". The New York Times. Retrieved February 22, 2009. ^ Michael Cabanatuan (August 12, 2008). 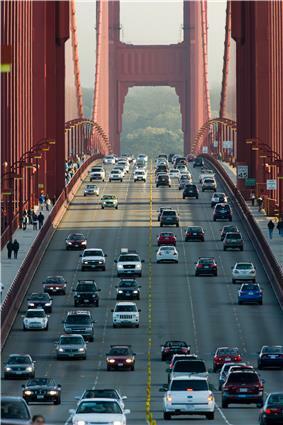 "Golden Gate Bridge congestion toll plan dies". San Francisco Chronicle. ^ Bone, James (October 13, 2008). "The Times" (ECE). New York. Retrieved October 23, 2008. ^ a b Koopman, John, Staff Writer (November 2, 2005). "LETHAL BEAUTY / No easy death: Suicide by bridge is gruesome, and death is almost certain. 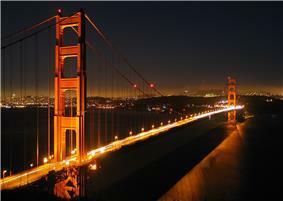 The fourth in a seven-part series on the Golden Gate Bridge barrier debate.". ^ a b Bateson, John (September 29, 2013). "The suicide magnet that is the Golden Gate Bridge". Los Angeles Times. Retrieved October 14, 2013. ^ Golden Gate Bridge, Bikes. Website of the Golden Gate Bridge Highway & Transportation District. ^ a b Adams, Jane Meredith (July 12, 1995). "Golden Gate Bridge suicides reach 1,000 and counting". The Baltimore Sun. Retrieved October 16, 2013. ^ Jacobs, Frank (July 11, 2009). "Bridge to Nowhere: a Map of Golden Gate Jumpers". Big Think. Retrieved October 18, 2013. ^ "1,000th succumbs to morbid allure of Golden Gate leap". Desert News. Associated Press. July 11, 1995. Retrieved October 20, 2013. ^ a b c d e Pogash, Carol (March 26, 2014). "Suicides Mounting, Golden Gate Looks to Add a Safety Net". New York Times. Retrieved May 8, 2014. ^ a b Bateson, John (May 25, 2012). "The Golden Gate Bridge's fatal flaw". Los Angeles Times. Retrieved October 18, 2013. ^ James, Scott (August 26, 2011). "A Year of Rising Suicides on Bridge and Tracks". the New York Times. Retrieved October 14, 2013. ^ Dobuzinskis, Alex (February 26, 2014). "Golden Gate Bridge hits milestone in 2013 with 46 suicides". Reuters. Retrieved February 26, 2014. ^ Libman, Joan (May 22, 1987). "Golden Gate Bridge: Triumph, Tragedy: Suicide Rate Shadows the Span's 50th-Anniversary Celebration". Los Angeles Times. Retrieved October 21, 2013. ^ Suicide forest' yields 78 corpses"'". The Japan Times. February 7, 2003. Retrieved May 3, 2008. ^ Lagos, Marisa (January 17, 2007). "34 confirmed suicides off GG Bridge last year". The San Francisco Chronicle. Retrieved January 17, 2007. ^ "Weird California: Golden Gate Bridge". November 11, 2006. Retrieved May 27, 2012. ^ Adams, Cecil (March 11, 2005). "Could you jump off a bridge or a tall building and survive the fall?". The Straight Dope. Cecil Adams. Retrieved April 12, 2006. ^ Preuitt, Lori (March 10, 2011). "Student Survives Jump From Golden Gate Bridge". NBC Bay Area. NBC Bay Area. Retrieved March 10, 2011. ^ Leonard, Tom (March 14, 2011). "Teenager jumps 220ft off Golden Gate Bridge suicide spot for dare and LIVES". dailymail.co.uk. Retrieved July 29, 2012. ^ Meckles, Jennifer (March 13, 2011). "Teenager Survives Jump Off Golden Gate Bridge". U.S. News newsy.com. Retrieved July 31, 2012. ^ Art in Review: The Bureau of Inverse Technology nytimes.com. ^ Noah Shachtman (August 8, 2004). "Tech and Art Mix at RNC Protest (Archive.org)". Wired Magazine. Retrieved October 30, 2007. ^ Ostler, Scott (January 10, 2001). "Saving Lives Just Part of the Job". San Francisco Chronicle. Retrieved July 16, 2009. ^ "Golden Gate Bridge: Bikes and Pedestrians". Golden Gate Bridge, Highway and Transportation District. 2006. Retrieved August 27, 2009. ^ Cabanatuan, Michael (July 9, 2008). "Judging the bridge's 5 suicide barrier designs". San Francisco Chronicle. Retrieved August 27, 2009. ^ Lam, Stephen (June 27, 2014). "Suicide nets approved for San Francisco's Golden Gate bridge". Reuter's. Retrieved June 27, 2014. ^ Jenni Olson (January 14, 2005). "Power Over Life and Death / Another toll goes up on the Golden Gate Bridge". San Franciscan Chronicle website. Retrieved May 10, 2014. ^ "Guardian of the Golden Gate Bridge". Yahoo!. December 5, 2012. ^ Cabanatuan, Michael (October 11, 2008). "Bridge directors vote for net to deter suicides". San Francisco Chronicle. Retrieved October 23, 2008. ^ "The Alternatives" (PDF). 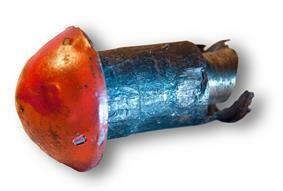 Golden Gate Bridge Physical Suicide Deterrent System Project. Golden Gate Bridge, Highway and Transportation District. Retrieved August 27, 2009. ^ James, Scott (August 26, 2011). "A Year of Rising Suicides on Bridge and Tracks". The New York Times. Retrieved July 29, 2012. ^ Reisman, Will (June 24, 2011). "Golden Gate Bridge suicide barrier nets funding, but more money is needed". San Francisco Examiner. Retrieved June 24, 2013. ^ Smith, Stephanie. "Funding for Golden Gate Bridge suicide barrier approved". CNN.com. CNN. Retrieved June 27, 2014. ^ "Frequently Asked Questions about the Golden Gate Bridge". Golden Gate Bridge, Highway and Transportation District. Retrieved March 12, 2008. ^ Carl Nolte (May 28, 2007). "70 YEARS: Spanning the Golden Gate:New will blend in with the old as part of bridge earthquake retrofit project". San Francisco Chronicle. ^ Showing fancy foot work. Roads&Bridges (December 28, 2000). ^ Overview of Golden Gate Bridge Seismic Retrofit Construction Project. goldengatebridge.org (February 2013). ^ Golden Gate Bridge Authority (May 2008). 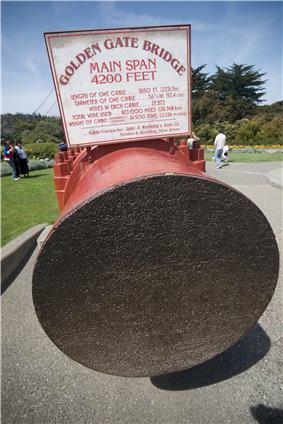 "Overview of Golden Gate Bridge Seismic Retrofit". Retrieved June 21, 2008. ^ Gonchar, Joann (January 3, 2005). 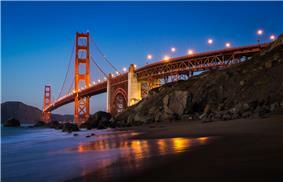 "Famed Golden Gate Span Undergoes Complex Seismic Revamp". McGraw-Hill Construction. Retrieved June 21, 2008. ^ "Presidio Parkway re-envisioning Doyle Drive". Presidio Parkway Project. Presidio Parkway Project. Retrieved May 6, 2010. ^ "Doyle Drive Replacement Project". Doyle Drive Replacement Project. San Francisco County Transportation Authority. Retrieved May 6, 2010. ^ Cabanatuan, Michael (January 5, 2010). "Doyle Drive makeover will affect drivers soon". San Francisco Chronicle. Retrieved May 6, 2010. ^ "Current Construction Activity". Presidio Parkway re-envisioning Doyle Drive. Presidio Parkway. Retrieved May 6, 2010. ^ "'"SMITH: It's wrecked, but it's still 'Doyle Drive. Press Democrat. Retrieved May 1, 2012. Eric Steel: The Bridge, a 2006 documentary film regarding suicides occurring at the Golden Gate Bridge. Louise Nelson Dyble: Paying the Toll: Local Power, Regional Politics, and the Golden Gate Bridge, University of Pennsylvania Press, 2009. Stephen Cassady: Spanning the Gate, Squarebooks, 1987 (commemorative edition; originally published 1979).